Give your investing and trading a positive jolt this spring. 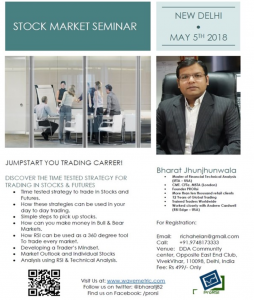 Join me on 5th May 2018 at New Delhi for this special “no-cost” training event. You will get my latest Market Update so you can know what he is seeing in the markets right now. PLUS, I will also explain a common way most simple way to RSI to trade in markets – and how you can avoid trading mistakes mistake to help you make better, more profitable trades. For more details refer the attachment broucher. I look forward to having you join me!